But sometimes Providence takes seriously what was a mere fraternal banter. In an unforeseeable way, the official announcement of Father Raja’s nomination as bishop reached us in the month of December 2015. 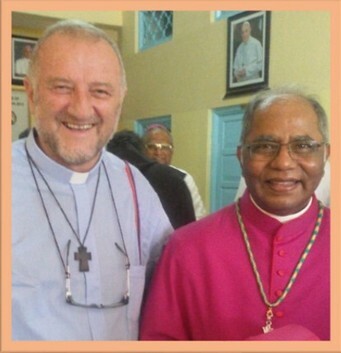 Without delay, I received an invitation from the newly elected bishop to present myself in India. With Father Santino’s accord, I accepted the adventure of such a trip, having the security of being accompanied by a Superior General who would take care of me, carrying my suitcase as a faithful and attentive servant. 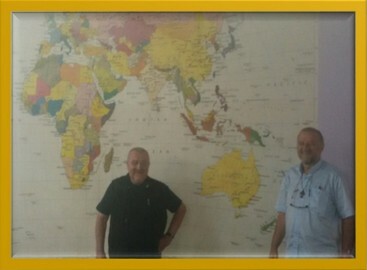 Arriving at Bangalore the morning of February 1st, Raja telephoned us on the road from the airport, wishing us welcome. My very first reaction was to tell him: “I am contemplating India.” And thus it was that for a week I contemplated India in the different aspects of its daily life, its religious life, and its missionary life. First Discovery: The welcome reserved for a guest surpassed every expectation. At our arrival at the airport, Bishop Gilles Côté, Montfortian bishop of Daru-Kiunga (Papua-New Guinea) and Father Michael Sagayaraj, superior of the Vice-Province, were awaiting us with a bouquet of flowers. This warm fraternal welcome was to bear itself out during our entire stay. 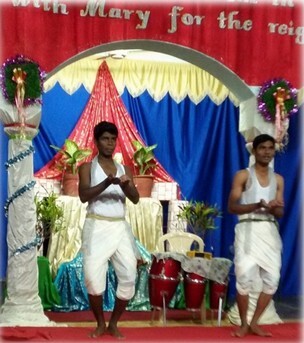 The night of February 1st we went to one of the three large schools of the Brothers of Saint Gabriel present in Raja’s diocese. With the Montfortian Family, and in the presence of Brother General of the Brothers of Saint Gabriel, Br. John Kallarackal, the young brothers in formation offered each of the invited guests a wreath of flowers and a shawl draped over the shoulders. February 2nd, at the site of the ordination, this ceremony of welcome was offered to each of the invited guests. 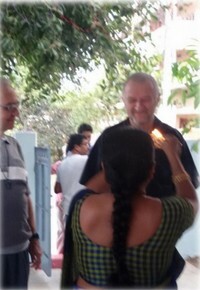 The day after the ordination, February 3rd, among Father Raja’s family, the welcome had become a celebration. One of his sisters approached each of the guests and with the offering of light, led us spontaneously into a time of prayer together. That same evening, in the family of a Daughter of Wisdom and in the presence of Sister Provincial, this same gesture of welcome was experienced in an unexpected way. Although habitually it is the bishops who wash feet, this time it was the mother of the Sister who asked our bishops to present their feet, pouring milk and then washing them with water. Such simple human gestures open hearts. India has realized the unity of its 29 “States”, whereas Europe has numerous difficulties to build its unity. Indeed, I discovered that each State possesses its culture and language yet nevertheless there is a single government and a single currency: the rupee. At our formation house in Mysore, which welcomes 38 young men finishing their secondary studies, these cultural differences are present. During a festive evening on February 5th, they underlined this diversity of belonging. Each group expressed itself with songs from their State. And yet a unity was created among them by the use of the common English language, their common studies, the fraternal services called forth in community, and the animation of community prayer particularly active and responsible and lived in fidelity to Montfortian spirituality. Without doubt these young men will be capable of assuring “a fraternity without borders”, won’t they? In an unexpected way, this diversity of behaviors is confirmed in the population’s manner of living. In a city like that of Raja’s episcopal residence, this diversity shows itself in unforeseeable fashion in the main streets. 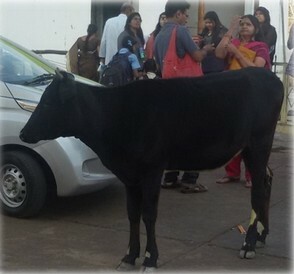 Everyone can and does take his place: cars, over packed trucks, motorcycles, numerous pedestrians, and even a cow, still considered a sacred animal. Radar doesn’t exist and the police are very discrete. At any moment an accident could occur. But the tried and true solution of the drivers is a token of unity in traffic which gives everyone security by the permanent use of the horn! 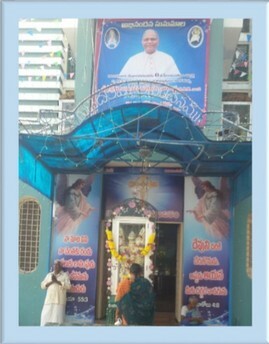 Father Raja is originally from this city of Vijayawada. His family house, although his brothers and sisters are now scattered around the globe, is located fifteen kilometers from the bishop’s residence. We had the joy of being welcomed in his family house. We were also able to visit the immense university grounds of Andhra Loyola College where Raja did his higher studies. Because of being so rooted in all this, the crowd was really present for this ordination. Some estimated the numbers present at 10,000 and for other: even more! The diocese made this event the meeting of a people. The word was spread along the whole route from the bishop’s house to the Marian sanctuary about three and a half km. distant. Photos of the new bishop appeared every 100 meters. The celebration was prepared with care: the professor of liturgy who was now our new bishop must have been most satisfied. The presence of a dozen bishops and 600 priests allowed us to see a fraternal support. The four hour celebration, going into the falling night deepened the recollection of all. Fourth Discovery: “Grandmother France”, as Raja used to remind me, had the privilege of being present in India. The privilege of this presence belonged in the first place to Father de MONTFORT. I appreciated the way in which our young men animate their prayer in fidelity to Montfortian spirituality. The message goes beyond written documents. In India there is always a concrete manner of manifesting one’s attachment to the spirituality. Our 38 youngsters freely present themselves before the Grotto of Lourdes in Mysore with their bikes in hand, ready to take them to classes. In the various places visited, our Father de MONTFORT is often represented as a missionary on the march. To know how to go beyond borders seems realizable with these young generations of Montfortians. Another link with France is the diocesan sanctuary of Our Lady of Lourdes. People of all religions come to recollect themselves. On the outside of the sanctuary, small candles are lit or coconuts are crushed as a gesture of offering to the Virgin Mary. Not quite gotten up to the Grotto, which is situated on the hill, I saw this old man standing outside the sanctuary, regularly partaking in all the times of prayer, while – it seemed to me – belonging to another religion. The Virgin Mary can carry all our efforts of faith. It suffices to have confidence in her in order to go beyond the frontiers of the religions, cultures, sufferings and hopes of peoples. Eight days after the birth of Jesus, an old man whose vocation was to be a prophet, discovered a family loved by God. In 2016, another old man, whose mission is to live in international community, discovered a people rich in a humanity made from belonging to diversified cultures and a whole history. The future belongs to the fraternity without borders. 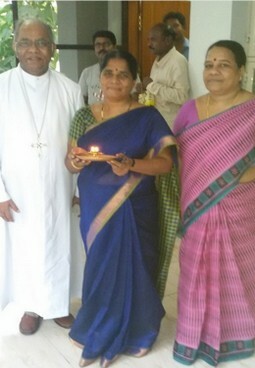 I congratulate Bishop Raja for your saying yes to the Almighty God for the new role you have undertaken in the Church. I was with you on the 2nd of February during your consecration and indeed, it was my birthday and the closing of the year of the consecrated life. Bravo Bishop! We are with you. St. Louis De Montfort is happy to see that his disciples are taking part in the renewal of the Church as we celebrate the 300 years of the Congregation's mission in the world. Through the intersection of the Blessed Virgin Mary, Our Lady of Mercy, wishing you God's blessings.